The career landscape of the 21st century, characterised by work interruptions, opt-outs, and temporary contingent work assignments, requires that we think differently about linear careers. Until now, much of the career literature has been based on men in the twentieth century who had linear careers in a single corporation or industry. However, men and women in the 21st century have unique career trajectories, sometimes fulfilling the ideal of a linear career, but more often characterised by opt-outs, contingent employment contracts, and part time work. The Kaleidoscope Career Model (the KCM) (Mainiero & Sullivan, 2005, 2006) addresses the unique features of male and female careers, and takes into consideration the non-linear aspects of contingent work. The KCM posits that needs for authenticity, balance and challenge over the course of a career will be present but arise at different intensities across the life span. Authenticity is defined as an individual’s need to behave and demonstrate their attitudes in accordance with their genuine inner selves, which may be in contrast to the behaviour they exhibit to survive in work surroundings. The parameter of authenticity represents the individual’s need to be true to oneself and one’s values. Often authenticity is displayed through behaviours resonant with personal or work strengths or involvement in activities for personal pleasure that genuinely reflect the inner nature of that individual. Authenticity also is manifest in refusing to go along with “politics” in organisations, following one’s passion for art or culture, or simple speaking truth to power. Balance, defined here as a parameter of the model, represents work-family management and integration efforts on the part of employees to create a work-life intersection that constantly adjusts attention to both domains. To meet a need for balance, individuals may choose certain contingent career assignments that allow them to restrict work hours or slow down career progression to integrate family life with work. Sometimes individuals leave a job in a corporation and find work in a smaller local firm to spend more time with family members. There are several ways to rebalance work-family management priorities, such as adjusting work time through part time employment, opting out of the workforce temporarily, taking turns with spouses, arranging workloads in accordance with family situations, or finding ways to meet both demands simultaneously. Challenge refers to the need to participate in intrinsically motivating work, to grow and develop one’s skills, and to make progress in one’s career through lateral progress, skill based programs, or linear advancement. Challenge refers to an individual’s need for stimulation, learning, and skill growth to increase personal capabilities. Challenge may be represented in a variety of ways: one’s desire to climb the career ladder, discovering opportunities to retrain and develop a new skill set, or a new set of job tasks. While all three parameters may remain active over the course of one’s career, the model suggests a dynamic, interactive, contextual paradigm such that one parameter may rise to ascendency at a given point when dealing with a career transition. In other words, individuals may consider one parameter as the impetus for their next career move. If balance is fitful, perhaps it is time to slow down and take a job elsewhere in a smaller firm. If challenge is missing, it may be time to switch careers. If authenticity is needed, finding ways to speak truth to power or develop hobbies or outside interests might be of value. This does not mean that the remaining parameters have little influence; instead, during times of transition, one parameter may rise, but the remaining parameters represent motivations to find a better person-job-career fit as well. Mainiero & Sullivan (2005, 2006) found that the KCM was enacted differently by men and women. 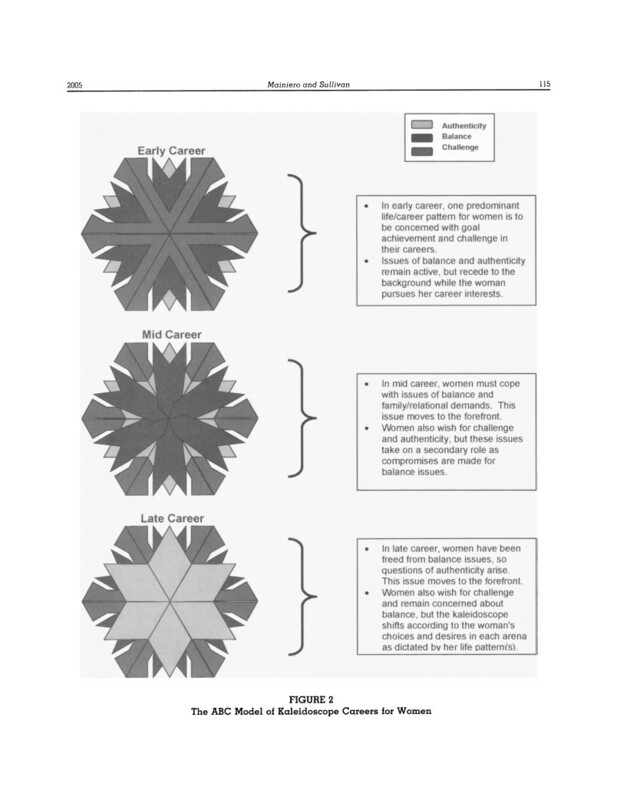 Two major patterns were identified: the alpha kaleidoscope pattern, characterised by challenge in the forefront, and balance and authenticity trailing, and the beta kaleidoscope pattern, which suggested balance as the primary motivator while challenge and authenticity remained active, but at lesser levels. While most individuals “want it all” when they begin their careers, at midlife the sharpest divergence of the parameters between men and women appear. In our most recent study, we attempted to examine more closely the parameters at midlife for men and for women. We found that there was variance in the three parameters across five segmented career stages by gender, with balance increasingly important in full mid career (15-25 years in the workforce) for women but of lesser importance for men. Authenticity showed a similar pattern for men and women, with authenticity rising for women and declining for men in very late career. Challenge remained consistent for men and women, declining in importance over time. Several authors have written about the drain in women’s ambition over time. The KCM describes this differently. According to the KCM, both men and women seek challenge, balance, and authenticity over the course of their careers. But at midlife, while in transition, the difference between the parameters may be sharper, and more individuals (especially women) may prefer the beta kaleidoscope pattern, with a focus on balance in mid career, to the alpha kaleidoscope career pattern that is marked by strong challenge as well as secondary balance and authenticity. While gender remains an important contextual factor associated with career patterns women face a double bind that is exacerbated by persistent socialised gendered schemas and may simply be enacting an updated self employed, short term horizon carer model by choice. Therefore, firms should be mindful of the changing dynamic and fluid aspects of career development in this new age of portfolio careers, protean careers, and boundaryless careers that suggest that men and women may have different needs at different points in the career cycle.